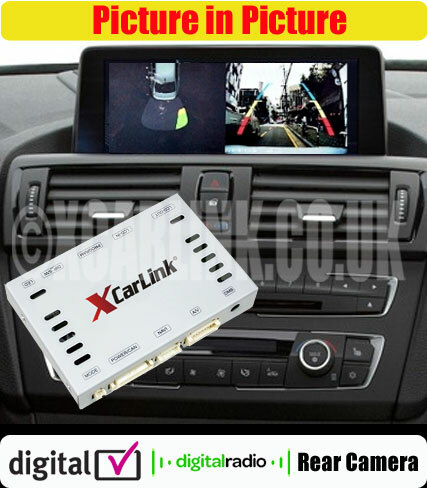 Xcarlink BMW F20 F30 Multimedia Video Interface with Digital Radio & Digital TV control and PIP. The new Xcarlink v4 Multimedia Video Interface takes multimedia integration to the next level by offering a range of additional features. 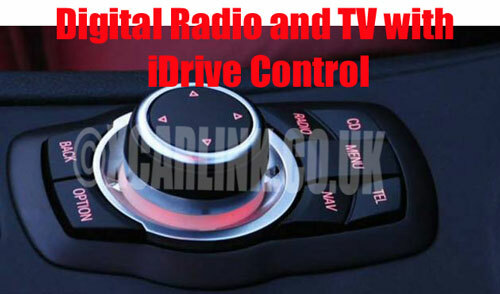 Not only can you connect any video source to your original factory fitted display (such as DVD player, TV Tuner, iPod Video, games console etc) ; it also allows you to control Digital TV and/or Digital Radio (DAB) via the original iDrive controller for a fully integrated solution. It features a dedicated rear camera input with parking guidelines that automatically displays on your screen when the car is in reverse. In addition this interface also features Parking system advanced Guidelines where the reverse camera is automatically displayed on the iDrive screen when the car is in reverse gear and the image is overlaid with coloured graphics and shows the path that the vehicle will take based on the position of the steering wheel. The interface also supports the Picture in Picture (PIP) function, which allows the original PDC and rear camera can be viewed on the screen at the same time. The PIP also allows the external video source to be displayed together with the original display, for example a split screen showing both OEM Navigation with Digital TV or DAB. When combined with our DAB module, our interface provides you with a fully integrated Digital Radio (DAB) solution where you can select stations via the BMW iDrive controls. Rear camera with Parking Advanced Guidelines which move with the steering wheel to aid accurate and safe parking and reversing. Built in "Video in Motion" for factory fitted TV Tuner or DVD player. Customizable menu system for screen adjustment, parking guidelines etc. The video interface is fitted to the back of the screen and head unit using a plug and play harness. Once installed, press and hold the MENU button on your iDrive controller to switch to the video inputs. The DAB module is connected to AV1 and DVB-T connected to AV2 if these devices are being installed. 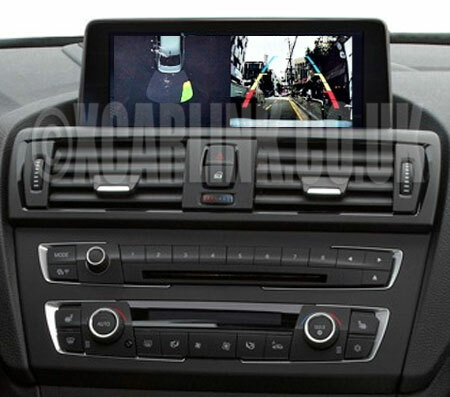 The interface automatically switches to rear camera when the car is in reverse gear. Please note: For audio, the interface must be connected to the car's AUX input. Select from the drop down menu above to add the following options specifically designed for use with our interface. Retain the original look of your vehicle whilst adding the DAB and DAB+ function. Displays station list and station/track/programme information on your screen and use your iDrive controls to change between the stored stations. This is the ideal solution if your vehicle was not supplied with the DAB option as standard. Watch digital TV anywhere you go in your car. This high quality digital tuner is supplied with dual amplified window mount antennas for superior reception, especially when on the move. It is perfect for use with our video interface and you will be able to use the original iDrive controls to change channels. There is also a USB input for playback of audio and video files. The rear camera is specifically designed to fit the boot lid handle of the BMW. Please select from the required model from the drop down menu. We have extensively tested this product and are confident that it will work with all factory fitted systems in the car models listed above. You do not need have a factory installed TV Tuner or have anything enabled by a BMW dealer. Nor do you have to have to have any optional extras installed when the car was ordered. If for any reason you are not completely satisfied or have any issues with compatibility you can return it to us for a refund. The system is interned for passenger use only. We cannot accept any liability of any material or personal damages caused by the installation or use of this product. Therefore, installation of this product will be performed at the user full responsibility.